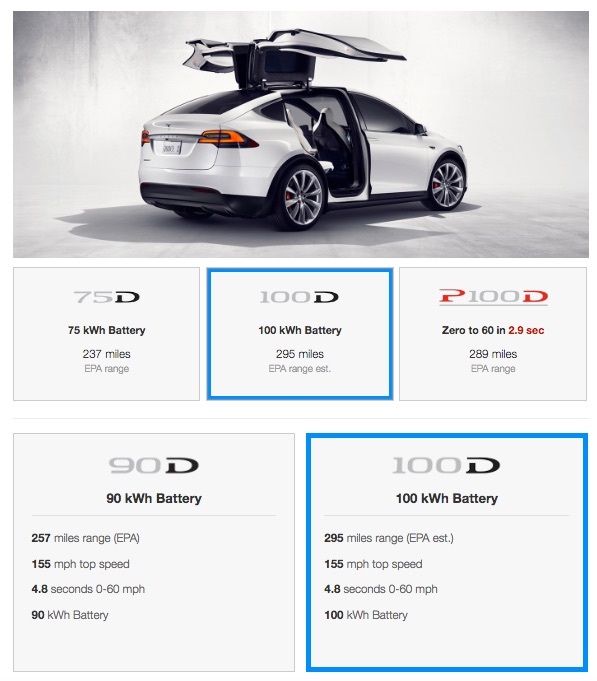 In the last few hours Tesla updated their site with the following options for the X.
I wonder what battery is used in the "Model X" (270mi range)? Perhaps a software limited 100kWh pack? 270 would be the 100kWh. 254 is the 90 kWh. It looks like they are calling the "Model X 90D" just "Model X" now. What happens to folks like me who ordered a 75D in mid January? Any idea what Tesla did in the past when they transitioned over. I initially had a delivery date of End of January and I got a text last night saying my delivery is moved to Early march. Any pointers would be great. I am also interested to know if any of the 75D already delivered will be eligible for 100D upgrade with the $8K or I have to pay the full $16K for upgrade. Either ways, sometimes i feel the tesla radical price updates is ridiculous. From what I've read on the TMC fora, all Model X and Model S batteries will use the 100 kWh battery pack. The differences will largely be in the way they are software restricted. Basically the choices are Model X/Model S, Extended Range, Performance and Ludicrous. What's the difference between Performance & Ludicrous? Performance has 289 mile range, top speed of 155, and 0-60 of 3.5s, starting at 107,950. Ludicrous adds 20% faster acceleration with 289 mile range, top speed of 155mph and 0-60 of 2.8s, starting at 127,950. On a separate note, I have a 100D on order. I was originally told it would be available by the end of January but recently got a message saying it will be ready mid Feb to early March. If I were ordering now, I'd likely get the standard X rather than extended range. Does anyone know the best way to approach Tesla about adjusting the price to at least match the $1k price drop? Any other options? My MX dropped $5k from the time I placed my order until delivery. They will not drop the price from what you agreed to pay. If the price had gone up, your price would not go up. Has Tesla confirmed that they are using the same battery in the standard and extended range models? And that it will be able to be unlocked for a future fee? My Model X 100D delivered in June 2018 has range of 295. They updated my order that I placed in January for March delivery, dropped 1000$ off previous price...nice they did that! Can’t wait..